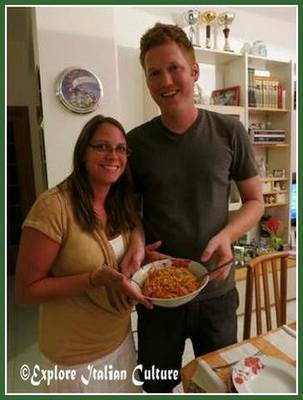 An easy fresh pasta recipe from our friend Graziella's kitchen. An easy fresh pasta recipe - the Italian way. There’s a bit of a myth around how to make pasta. People think of it as a kind of mystical process with which only Italian people can have any success (and sometimes Italian people think the same!). This simple, authentic fresh pasta recipe will show you it's not that hard. 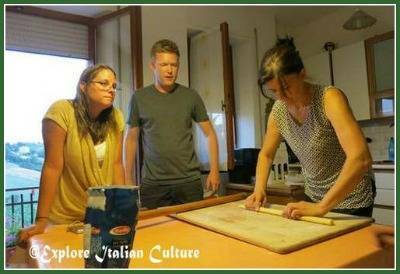 We learned when our American cousins came to visit and wanted to take some Italian culture back home. 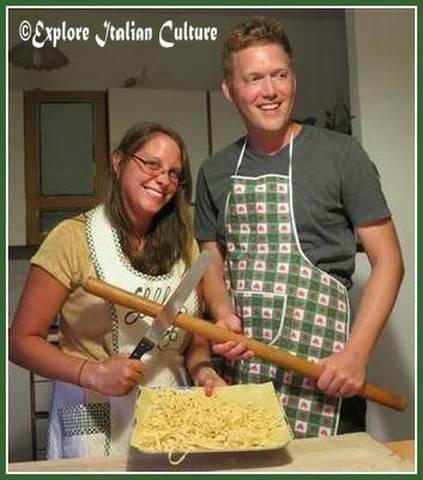 And of course, pasta is an important part of Italian culture. 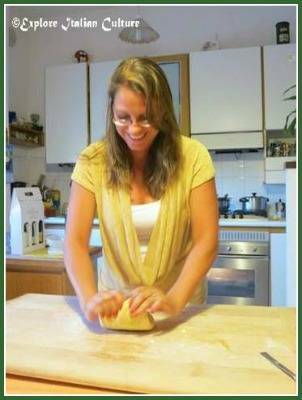 Our good friend Graziella demonstrated how - and now it's our turn to share her method with you. 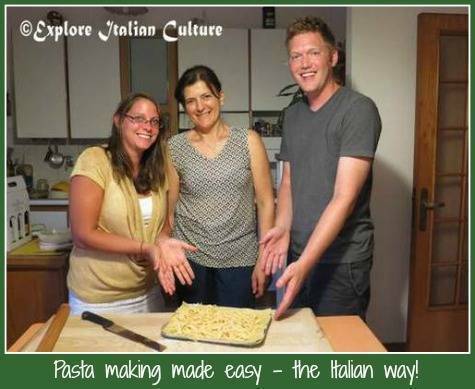 Why bother learning how to make pasta? It tastes completely different to the mass-produced type. It has no additives or preservatives. Sauces cling to it much more easily. It takes a very short time to make. It takes an even shorter time to cook. It’s really good fun to make it with kids - they love watching the dough stretch! Like most good Italian food it’s a very simple recipe using ingredients you are likely to have in your store cupboard and takes only a short time to make. The 'resting' period means it will take about forty minutes to prepare in total - but you can be making a fresh sauce while you leave it. Fresh pasta recipe : ingredients. This recipe is plenty for four people. As a rule of thumb, Graziella allows 100 grammes (3.5 ounces / 0.5 cup) of flour and one egg per person. Try to find 00 flour. It's widely available in Italy but may be difficult in other part sof the world. It's a very fine grain which makes the best pasta. If you can't find that, use a good, strong bread flour. Fresh pasta recipe : how to make it. 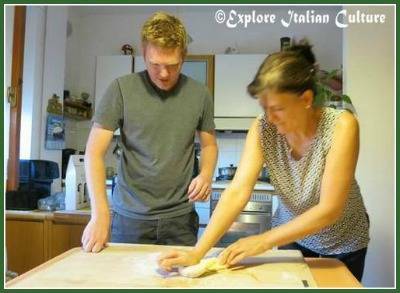 Graziella (and most Italian people) mix the dough directly on their pasta or pastry board. If you don't feel comfortable with that, use a large mixing bowl. Put the flour in first. Pile it in the centre of the board and make it look like a volcano - a crater in the middle, walls round the outside. Now break the eggs into the middle of the flour - no need to beat them first. Break the egg yolk and starting with the inside of the flour 'wall', bit by bit mix the flour into the egg until all the flour has been incorporated. It's easiest to do this using your fingers. Use the hand that's not mixing to keep the flour from spreading out over the board. Now start to mix this together, using your hands. At first the mix will be crumbly and sticky - keep your hands and the board lightly covered with flour to prevent this. Don't be tempted to add too much or the pasta will taste heavy. Keep working the mixture until it forms a soft ball. Now's the time to start kneading. ...and then bring it back towards you, foliding it over as you do so. Keep kneading the dough until it forms a really smooth texture. This will take somewhere around eight or nine minutes. To make the douogh easier to work with, wrap it in cling film (Saran Wrap) at this point and put it into the refrigerator. Leave it for about twenty minutes. If you don't have time to do this, just keep kneading the dough for another five or six minutes. Make sure your hands keep cool. Now you're ready to roll it out. 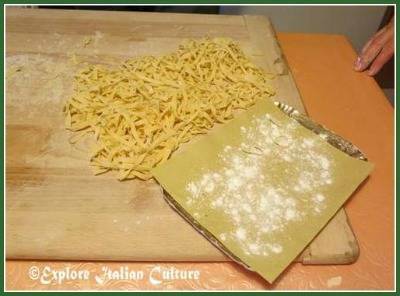 Fresh pasta recipe : to roll or not to roll? The rolling and cutting is the longest part of the process and the most time-consuming. 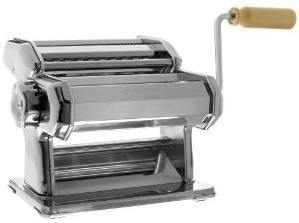 Although it's fun, and the traditional way to make any fresh pasta recipe, most households now have a manual pasta machine cutter to make the thinning and cutting process easier and quicker. For more information about these machines have a look at our page here or click the image, and see how Graziella uses it in her day to day pasta-making. 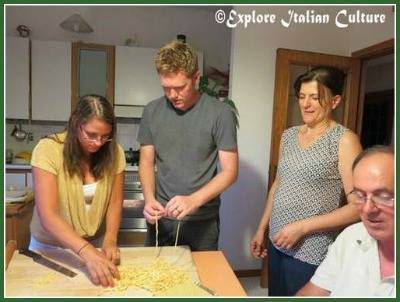 Want to carry on with the fresh pasta recipe in the traditional way? Take your piece of dough and shape it roughly into a rectangle. Make sure your board, hands and rolling pin are lightly covered with flour. Now - roll! 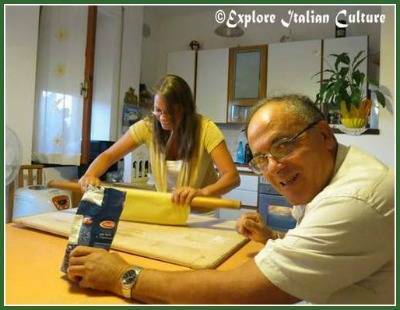 You will need to put quite a lot of pressure on the rolling pin to force the dough to become thinner. Don't be scared! - It will by now be very elastic and not easily harmed! 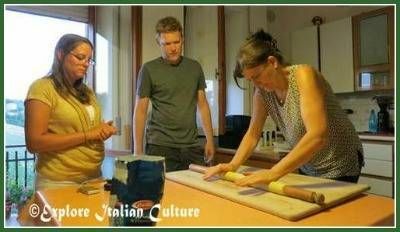 The traditional pasta rolling pin is, as you can see, very long! If you can't find one this big don't worry - a smaller one will take a little longer but will do just as well. 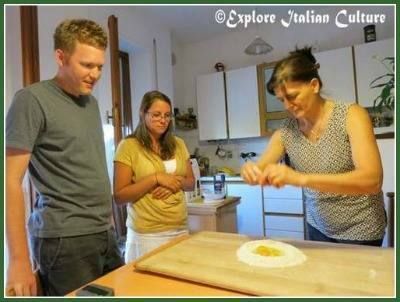 Keep rolling the pasta dough until it becomes very thin. Do not be tempted to add a lot of extra flour when you're rolling. The dough shouldn't stick if it's been well kneaded. Graziella's husband, Claudio, had to be held back from adding a lot more! Graziella cautions against this because the dough, and your pasta, will taste much heavier if you add more flour. Once the dough is thin, and about 18" long, stop rolling. Roll the dough up lengthways, so that it looks like a long, thin sausage. Using the sharpest knife you've got, cut the dough into strips. The wider the strip, the wider the pasta will be. Using your fingers, tease the pasta strips out of their sausage roll and hey presto! 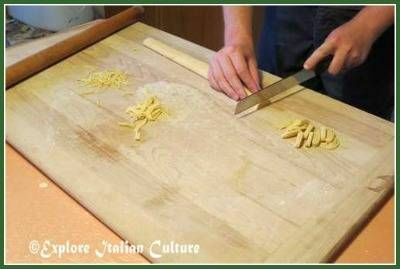 - long strips of pasta, cut to exactly the width you choose. If you've seen another fresh pasta recipe it may well have told you at this point to use a pasta rack - a plastic or wooden stand from which you hang your strips to dry. 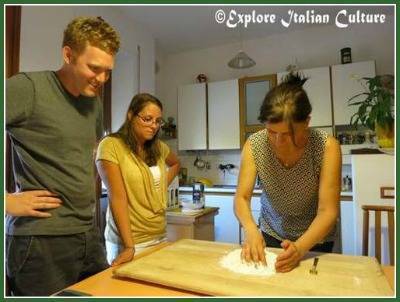 In fact, Italian people use a simple platter covered in kitchen roll and sprinkled with a little flour. Leave it for about thirty minutes before cooking. Don't cook it until you are ready to eat. Unlike dried shop-bought pasta, this fresh pasta recipe means you need cook your pasta for only a couple of minutes. Bring a pan of water to a rolling boil, add the pasta and, when it floats to the surface, it's cooked. Add it to your favourite sauce (never the other way round - the sauce needs to coat the pasta if you want it to be authentic) - and eat! No time to make a fresh pasta recipe yourself? That's a shame - it's good fun! But for many families these days it's a fact of life - there just aren't enough hours in the day. There are still ways to have great, healthy, home-made pasta though. We have a review of one of the best pasta machines on the market - the Lello Pastamaster - which does it all for you in about twenty minutes. You don't get the same fun of kneading and rolling, but you control the ingredients so it's healthy and it tastes good - and your kids will love watching the finished pasta being squirted out! Click on the link above, or on this image, to find out more.